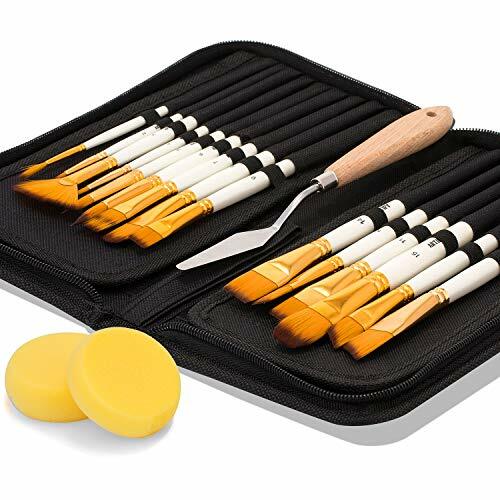 FERRULES DON\'T GET LOOSE- Artify paint brush has used a heavier glue on where wood and bristles meet, so the ferrules don\'t come off easily. NO LOOSING HAIR ON PAINTING - The problem that hairs fall off has been bothering us for long time; however, we used a selection of high-quality nylon materials to minimize the possibility of hair loss. WATERPROOF TEST- The 3 layers of coating and the heavy glue on the head of wood make it perfect for soaking in water for more than 48 hours. After finishing your work, you can easily just put them in the sink and wash it whenever you want. SELECTED COLLECTION OF SHAPES AND SIZES - To bring up fresh inspiration, Artify has selected 15 different shapes and sizes brushes as a set. They are liner, flat, angular, filbert, round, fan, and comb. The paintbrush set could satisfy you whatever detailed painting or largest coat applications, every stroke will come to life. CARRY CASE WITH POP-UP STAND - More than just a convenient storage solution, the carry case can be used as a pop-up stand that lets you easily swap out brushes while you work. The carry case can also be folded shut and put safely in your backpack or carry bag. Two sponges and a palette knife as free accessories for better painting work. Amazing set especially for the price!